The summer dining room, 2002. The small room behind the parlor, a place for quiet reflection, was where Henry wrote his poem "The Rainy Day." During the 1840s, it served as an office for his brother Alexander, but after Alexander left the house, it was converted for use as a summer dining room. In March 1853, Anne wrote "of the charming paper" brother Sam provided. "The paint is to be oak [grained], very light and the back entry to match—it all needs the renovation badly, but I do hate to change any thing so much." The 1850 book The Architecture of Country Houses, by A.J. Downing recommended this painted finish: "The great advantage which grained woodwork has over that which is simply painted white, is that it is so easily kept clean…The grained surface being made smooth by varnishing, does not readily become soiled." This durable decoration has survived remarkably well for 150 years. The northern exposure with a view to the garden offered cool, welcome relief from the noisy street. As the fireplace was not needed, the fireplace opening was closed with a fireboard covered with wallpaper, a popular nineteenth-century technique. The room was furnished with mahogany drop-leaf dining tables and rosewood-grained side chairs. Photographs show the mahogany writing desk used by the poet in a new role as a sideboard. New additions included an oil-burning lamp with counterweights that allowed it to be raised and lowered. 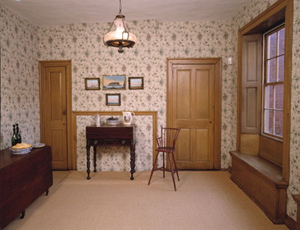 Anne completed the room with a straw carpet, a popular floor covering. Important family tablewares include a colonial silver tankard made by John Butler, a creamware pitcher made circa 1800 in memory of George Washington, and Zilpah and Stephen Longfellow's blue and white Staffordshire wedding china. The pitcher, inscribed "Washington in Glory / America in Tears," was used to serve lemonade on the Fourth of July. Even after it was cracked, it still made "its annual appearance on the day of National rejoicing." The room also features a portrait of Anne at age 20 by Joseph Greenleaf Cole. In April 1853 Anne "installed wallpaper above the grain-painted woodwork" and described the entry as "much more tidy and lady-like…I have an oil cloth like the front one and upon the whole we look pretty well." The new wallpaper featured ashlar blocks, a pattern resembling masonry that had been fashionable, especially in halls, since colonial times. Anne sought an "old fashioned" design. The wallpaper covered pencil inscriptions by the family dating between 1832 and 1852. Early nineteenth-century leather firebuckets, made by local saddler Aaron Fitz, were handy in case of need as were iron coat hooks. A handsome gothic-revival ceiling lamp illuminated the space.